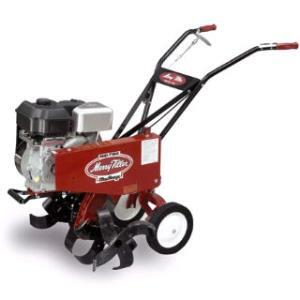 Whether breaking new ground or maintaining an existing garden, our mid-tine tillers are perfect for any size garden. The drag bar and wheels are easily adjusted with the simple removal of a pin, and the machine tills a 26" wide swath down to a maximum depth of 12". The machine weighs approximately 125 lbs. * Please call us for any questions on our roto tiller front tine rentals in Hillsdale and Ridgewood NJ.